Did you ever wonder how to interface a resistive graphene (GR) or multiwall carbon nanotubes (MCNT’s) nanotech sensing element? What about an impedance (resistive – capacitive) metal nanoparticle (MNPs) sensing element? Well here it comes… Graphene Intelligent Systems presents a multichannel interfacing electronic circuit with USB connection capabilities for bidirectional communication and data recording. Its embedded firmware (available from github for resistive elements)developed for the low cost AVR ATtiny861 microcontroller (MCU) enables measuring simultaneously three reconfigurable channels on the same PCB board capable interfacing with resistive or capacitive sensing elements. The resistive sensing elements are made from metal interdigitated electrodes coated with graphene or CNTs. The capacitive sensing elements are based on laser annealing thin film metal electrodes forming interdigitated electrodes with metal nanoparticles in the between gap. The operating principle for the resistive sensing elements is based on Thevenin’s Theorem where the interfacing of the sensing element with the MCU’s internal analogue to digital converter (ADC) is performed through a differential amplifier for amplifying the signal. For the capacitive-impedance sensing elements (metal nanoparticles) the charge-discharge time of RC constant formed between an external reference resistor and the instant capacitance value from the sensing element is measured with an internal counter in the MCU. The Nanosensor board is designed to communicate with the host systems through USB port allowing to be powered directly at 5V. This capability make’s the Nanosensor ideal for portable measurements when is combined with an organic photovoltaic module (OPVM) power bank and a low energy wireless internet of things (IoT) transreceiver. Smart window for indoor energy collection in snowing winter! Graphene Intelligent Systems were participating at the European PV characterization workshop organized under the EU FP7 CHEETAH project. The thematic area of the workshop was on characterization techniques for organic, inorganic and hybrid photovoltaic technologies. The workshop held at Fraunhofer ISE institute in Freiburg of Germany at 14th January 2016. It is Christmas time 2015 and Graphene Intelligent Systems are getting excited to present paper plains and origami designs utilizing flexible organic photovoltaic (OPV) foils. The organic photovoltaic module (OPV-M) foil, which we use for the designs here, is very light and flexible ideal for making flying solar paper planes and origami. We call the solar paper plane “Daedalus alpha” based on the legendary personality from Greek mythology who fabricated wings from wax and flew above the Greek sea. Second design is an origami heart, which it can potentially produce enough electric energy to power up an LED, similar concept to a previous post. We call it “O-HEART”, the “O” comes from Origami / Organic PV words and “HEART” because OPV technology is in our heart and we love large area, printed electronics! The question comes down to what can you do with them? 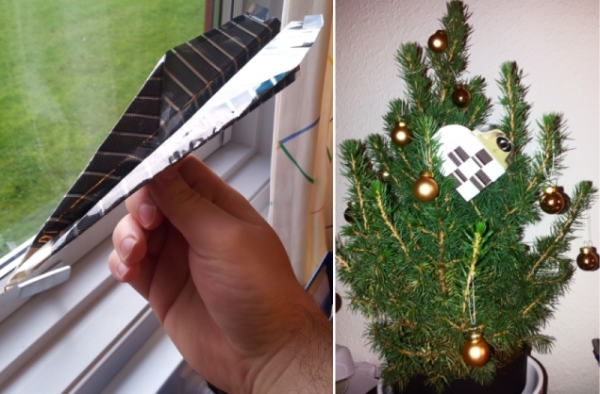 Well, you can have fun by flying an OPV solar paper plane and decorate your Christmas tree with something unique. Graphene Intelligent Systems LIKE the new research study “Adsorbent 2D and 3D carbon matrices with protected magnetic iron nanoparticles, Nanoscale, 2015,7, 17441-17449” on magnetic graphene sponge for skimming off pollutants such as oil spills from the surface of water. It utilizes low cost sponge graphene anchored with tiny iron nanoparticles to retain pollutants from large volumes of water. The magnetic graphene sponges can later on retracted and removed from water using a simple powerful electromagnet. More to read available here. OPV digital IoT gauge meter back to life! Graphene Intelligent Systems are excited to bring the digital IoT gauge meter back to life. 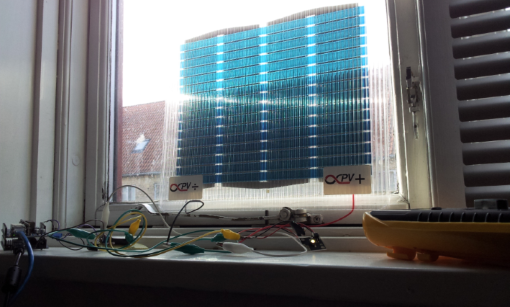 This time connected with an OPV from www.infinitypv.com. Stay tuned for more exciting projects. Graphene Intelligent Systems were presenting at XIV Brazil MRS Meeting and ISOS 8 international Summit on Organic and hybrid photovoltaics (HOPV) stability held at Rio de Janeiro in Brazil.